THE BANGKOK Metropolitan Council will tomorrow decide whether to pay for an extension of the BTS Stytrain, known as the Green Line. 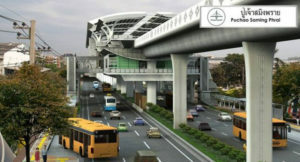 The Bt3.55 billion is the first instalment of the project’s total Bt21.4 billion for infrastructure construction. Chayawuth said that if the council did not approve the extension, the MRTA would have to handle the project by itself. According to an informed source, part of the extension should have already started its free trial run last month. However, delays have occurred because the BMA has not yet paid the MRTA. “Infrastructure construction for this extension route, in fact, has already been completed,” the source said. Under the contract signed by the MRTA, the BMA and the Transport Ministry in 2015, the BMA will take over the extension of the Skytrain between Bearing and Samut Prakan, plus the extension route between Mo Chit and Kukot. The BMA has assigned its legal investment arm, Krungthep Tanakom, to operate the extension. Speaking on condition of anonymity, a source at Krungthep Tanakom said yesterday he did not think the project had been delayed over payment issues. “We are in the process of waiting for the MRTA to check works carried out by contractors. The checks are due to take place by February 6. In addition, we have already started installing train-operation systems and related systems too,” he said. A source said the government might be forced to pay the construction and operation costs of the Green Line extensions totalling Bt60.8 billion instead of the BMA, if the latter pulls out of the deal. 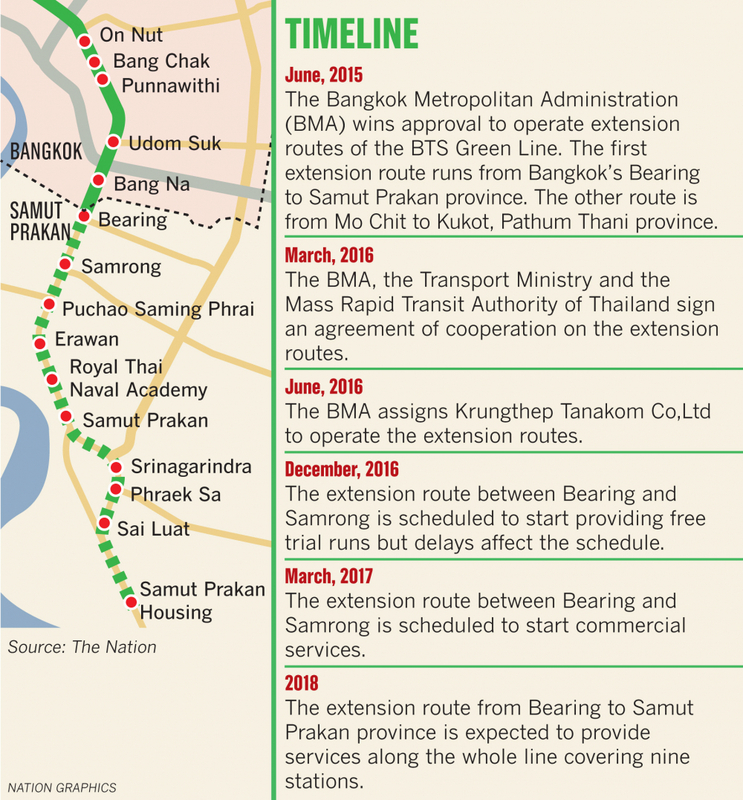 The MRTA previously signed an agreement with the BMA for assets transfer of the Green Line’s extended sections from Bearing to Samut Prakan and Mo Chit to Kukot. The assets, comprising civil engineering works and operations, are worth Bt60.8 billion. 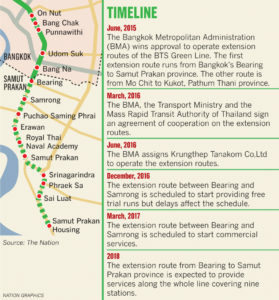 The source said the Finance Ministry might be have to pay for the Green Line extension if the Bearing-Samut Prakan stretch is to open as scheduled. This extension was scheduled to begin full operations along its entire stretch of nine stations before the end of 2018. A source at MRTA said that the authority’s board of directors was unlikely to transfer any assets of the two sections to the BMA unless payment was made.